First outfit back to work after Christmas and it includes sparkle, go figure. Is is weird to say a sparkly top is a basic in my wardrobe? 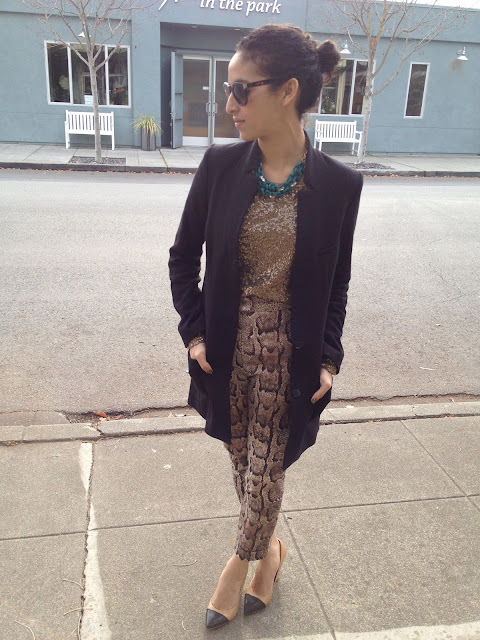 I've worn it, and these snake print pants during the day mind you- way too often! Oh well. Happy Friday! this is my absolute favorite outfit of yours! but to be honest, it's really hard to say that because i love all of your stylish outfits! 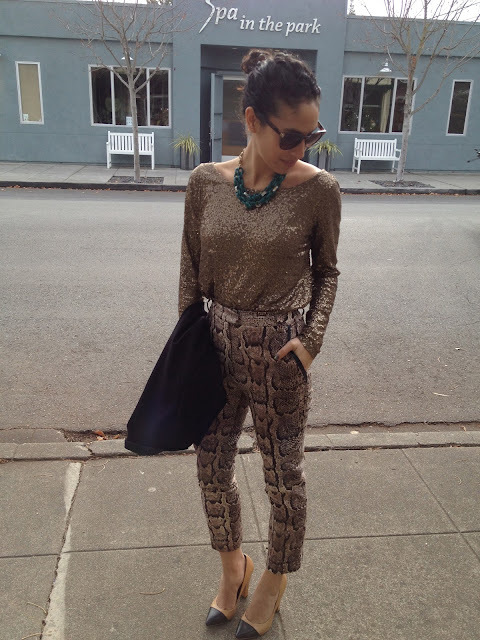 way to keep the sequins going in the new year!!! Thank you, lady! I definitely wear them year round! oh my gosh!!!!! i love, but love love your style! it is NEVER boring! have to say that you remind me of Carrie Bradshaw a bit (but in a best way), cause you have that something, at least when it comes to style! so chic yet unique! Wow, Milica- you sort of made my morning, weekend, month?! Your comment was really the kindest, most flattering I think I've ever heard. I am beyond grateful to have readers as kind with their words as you!!! And major points for referencing Carrie B!! Love this look, you've got the most amazing figure girl. There is never enough sparkles for us! I LOVED this outfit so much, and I will always remember it since it was the first day I met you...:-) awwww! Love these two together. So fun and so chic! I spy the same Zara shoes ;) LOVE THEM! Hope you had a lovely weekend lady. Haha, that's right were shoe twins!! My weekend was great, hope yours was too!! I love everything about this outfit! Especially the pants and the shoes. The shoes are gorgeous! I concur with Paulina's statement, I too love everything about this outfit! It's pretty rad and I love how you mix different prints and textures; and yet it somehow looks perfectly effortless on you... like you just threw them on. <3 it! Love those Zara heels, my goodness what a tease seeing as how they are sold out! Ahh, love your classic eclectic style, so good!